Identify Hartlaub's Duck - Wildfowl Photography. 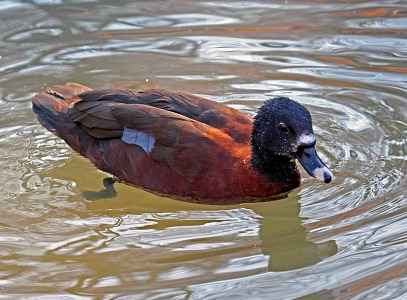 Appearance: - The male Hartlaub's Duck has a black head and neck and can sometimes have variable white patches on the crown, forehead and base of beak, the beak is black with a pinkish-white tip and black nail, the male's beak can sometimes be swollen at the base during the breeding season, reddish-brown eyes, a chestnut-brown body, the tail, rump, and upper wing are olive-brown, the upperwing coverts are blue, and the legs and feet are a dark yellow-brown. The female is similar but is slightly duller and has little or no white markings on the head. Size: - Typical Adult is 56-58cm (22-23in). Food: - Aquatic insects, larvae, molluscs, crustaceans, seeds, and roots. 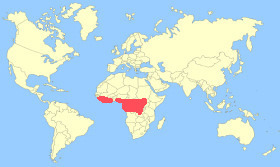 Habitat/Range: - Rainforests, wooded savannahs, forest streams, marshes, and vegetated pools in equatorial West and Central Africa, from Guinea and Sierra Leone east through Nigeria to Sudan, and south to Gabon, Congo and Zaire. Breeding Season: - Unknown but most likely during the rainy season. Eggs: - 7 to 12 (creamy-white colour). Notes: - The Hartlaub's Duck was considered a perching duck but is now placed on its own in the genus Pteronetta. Little is known about this duck in the wild and no wild nests have been found. It most likely nests in tree hollows and perches in trees. This duck is named after the German naturalist Gustav Hartlaub. This species has declined due to deforestation causing loss of habitat. Classification: - Family: Anatidae, Genus: Pteronetta.